The Grey Ghost was created to imitate a smelt. It has been used successfully for Salmon and sea trout on both sides of the Atlantic. The fly is one of the Rangeley style of feather wing streamers, meaning that the pattern not only comes from the Rangeley Lakes region of Maine but is also tied using a certain technique. Rangelely style flies incorporate the use of pre-assembled wings tied in at the head of the fly. Tag : Narrow flat silver. Body : Pale orange floss. Rib : Narrow flat silver tinsel. Throat : A strand or two of peacock herl, strands of white buck tail and topping with downward curve, optional. Wing : Four olive grey saddle hackles, topping optional. Shoulders : Silver pheasant body feather. 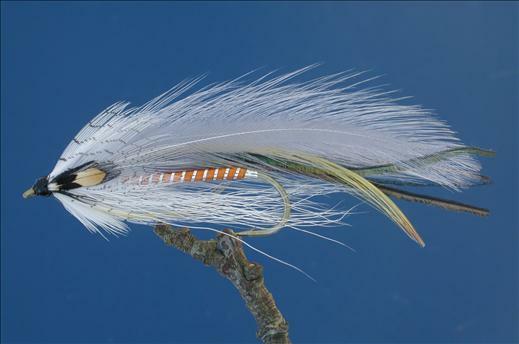 Currently there are no comments about the Grey Ghost fly pattern from other fly fishermen yet.